‘Summer greetings from Copenhagen! Over the last few weeks, I have been visiting the Centre for Textile Research to prepare my research project Textile Reflections, exploring how Latin texts describing textile making mirror ancient work processes. At CTR, I’ve enjoyed discussions with colleagues working on all aspects of textile research, from excavation of tools such as spindle whorls and looms to conservation of remnants of ancient textiles (there are many more than one would think! ), to experimental archaeology and reconstructions. Sagnlandet Lejre: The Land of Legends near Roskilde should go on the to-visit list for all interested in re-enactment of prehistorical and historical periods for its offer to sample the life of times gone by, but beyond the open air museum, Sagnelandet is also an important centre for experimental archaeology. 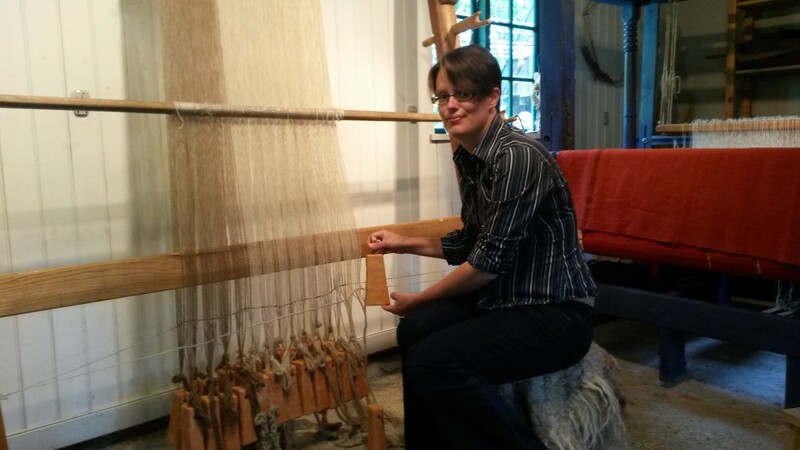 Dr Anna Rosa Tricomi from the University of Padua has been working on weaving and loom weight finds in the Veneto region, and has come to Lejre work with experienced weaver and archaeologist Ida Demant. I had the chance to visit them working last week, and to see their reconstruction of weaving around the turn of the millennium, a period ideal for comparison with literary descriptions close to my heart – those of Ovid’s Metamorphoses, the stories of the unlucky daughters of Minyas, of Philomela, and of Arachne. A perfect chance to test whether the tinkling sound of moving loom weights and the beat of the weaving sword really have any resemblance to the rhythm of Ovid’s poetry!